Bicycle Crazy is built from a personal passion for cycling and the desire to bring the cycling community together in a new way. There are many great cycling sites offering information on training, repairs, bikes specs and the like but there wasn't much that touched the core of cycling...The Cyclist! 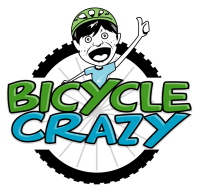 Here on Bicycle Crazy, you'll find lighthearted stories, unusual bike products, inspirational stories and just some good old fashion fun things about cycling. People from around the world are finding new ways to explore, share and enjoy the simple but fun sport of cycling! From innovative products, to cycling advocacy groups to incredible personal stories of achievement. The world is a big place...I prefer to explore it by Bicycle.